Today, I spent a great day in Wind Lake with my three sons. We had the honor of Safety training and tips from Rob Robins, a firefighter, EMT, and Dive Team member. In smaller towns, a firefighter must wear more hats, so we salute Rob Robins. We had a closeup look at all the many boats, trucks, and ambulances used to save lives. I learned about heart attacks, and God knows we have had more than our fair share at the Chicago Department of Water Management. Remember, spend time with your children in constructive learning events, and less time gambling and drinking. Photo by Patrick McDonough. January 17, 2006 – A Chicago Water Department worker who claims he was fired because of his whistle-blowing in the Hired Truck scandal will be getting his job back. Patrick McDonough’s attorney is calling for an apology from Mayor Daley. McDonough met with his attorneys Tuesday night. They gave him the details about Tuesday’s favorable recommendation by a city personnel board hearing officer. McDonough says his problems began with a complaint to his supervisor in 2001. “I told my superior that we had way too many trucks on the job site and we were wasting the taxpayers’ money,” said McDonough. “I don’t think I should be punished financially and with medical bills for doing what was the right thing,” McDonough said. The hearing officer has recommended that six months of McDonough’s back pay be withheld for his alleged failure to cooperate with the city’s investigation. The city personnel board will act on the hearing officer’s recommendations later this month. We need more families such as Patrick’s. 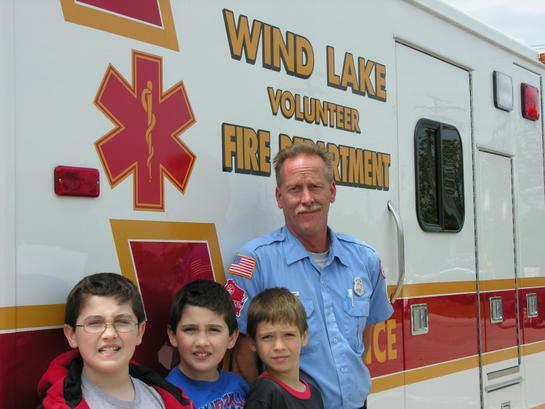 Hello Pat,I was just wondering how you found Wind Lake Fire Rescue?I used to live there about two years ago and Know Rob very well,Infact I was also a memeber of the WLFD when I lived there.Wind Lake Wisconsin is Around Muskego,Tichigan,Millwaukee,Big Bend Vernon,Burlington,ETC….They have to wear many hats to fill in the blanks when needed.The pager goes off and Blam Right to the station.I was just suprised to see you and your camera in WindLake,Is Wayne Meyers still the chief there? It is Wayne Myers. Class act! Wayne saved many lives and responded to my daughters accident. He saved her life. Wayne is a fire-fighter’s firefighter. He is a hero. Previous PostPrevious Far Away from the Cook County Politicians…..